I've been learning English since the age of 9 (if one can call it learning what we were doing at school), and enough is enough really, though the realisation that it was no longer a real challenge only came to me a year ago. I still learn a few new words now and again - life itself insists on that - but I just had to get my teeth into something fresh, and so, precisely a year ago, I started attending an A1 Italian course. In fact, it was not my first contact with the language - the first one happened about 20 years earlier and lasted just a few months. I remembered little of that, needless to say, but something stayed in my memory, and more came back as I was attending school. The upsetting thing about those schools is that people start but don't finish: of the eight people on the list only six turned up for the first trial lesson and only three saw the checkered flag. When it was time to start on A2, I found myself alone - even the teacher refused to continue citing "being busy", and so I had a new one. Who gave them the idea that hurting the student's self-esteem is the best way to achieve results, I'll never know, but that's a different story; the outcome of it all is, I'm now on my own with Italian, and in a silent period. Still bracing myself to try a Skype lesson... still feeling mortally shy about it. It's not easy to be a passionate language learner and an introvert at the same time. The idea to turn myself into a polyglot came a little later, but it came finally. It might sound crazy at my age, but people have been known to start later in life, and I have some natural abilities, so I said to myself, "why not?". I was going to start German next, but life decided differently. The company I work for was bought by the Chinese, and our bosses went there and experienced all the joys of language barriers (English is gorgeous, but it doesn't open all the doors). An email followed, which I could only read as a direct instruction to learn Chinese urgently. My colleagues read it differently - at least ten of them asked me the next day when I was going to start learning Chinese. Fortunately, I had already phoned the language school and had my answer ready. I started a few days later with a native speaker, but that course was destined to last only two months and mainly succeeded at overwhelming me. Now I'm attending a different school, and the second time around it seems so much easier. I've even mastered dictations... in Chinese characters, I mean, without looking at anything. My Italian, as I've mentioned elsewhere, is now going through the extensive reading stage (which, as life has proven to me, actually never ends). But with Chinese it won't work - not yet at any rate. I'll need a teacher for some time. French - June or July 2018. Spanish - either before or after Japanese depending on how it goes and whether my tired brain tells me to go hang. And that's just the first "wish list". Considering the impressive lists some of you guys have, I'm more than ever tempted to add a second. Last edited by LinguaPony on Sun Oct 29, 2017 8:27 am, edited 1 time in total. That sounds reasonable for a wish list. Huge and deliciously yellow, it is going to keep me busy and happy for quite some time. The first Italian lesson on Skype is over. No one has eaten me, as I kept telling myself throughout; actually, the teacher was very kind and considerate. But I'm still shaking. What's wrong with me? I'm never afraid of lessons in brick and mortar schools - in fact, I usually look forward to them. Last edited by LinguaPony on Sun Nov 19, 2017 5:34 pm, edited 1 time in total. Chinese: the dictations are getting tougher every time. The teacher dictates always in Russian, so we are supposed to translate the sentences on the fly and do them right in characters. Last time she asked for pin yin also, and that didn't help; tonight she didn't ask for it, but the order of words is getting more and more critical, since we have learned how to talk about time. So I got all the characters right, except one, but my mind was so busy retrieving them from memory that I completely messed the order of words up. I guess I need to do some such exercises at home during the weekend to do the next dictation better. Italian: No reading tonight, since I advanced quite considerably during the weekend and also yesterday. I'm loving Edgar Wallace in Italian. I don't have his books in English (an omission I might want to repair later), so no bilingual reading at the moment, but that's okay. I no longer really need it. Can't wait to start German. As December approaches, I feel more and more impatient about it. But I really need to gain more confidence with Chinese first, so I'm sticking to my plan. Last edited by LinguaPony on Mon Nov 13, 2017 7:02 pm, edited 1 time in total. Chinese: classes to look forward to, this evening. Cold November rain is slowly turning streets into creeks, so on my way back home my shoes will be soaked. And my jeans, too. Wondering how many of my groupmates are going to brave the weather and come. Wondering how long it all will last. 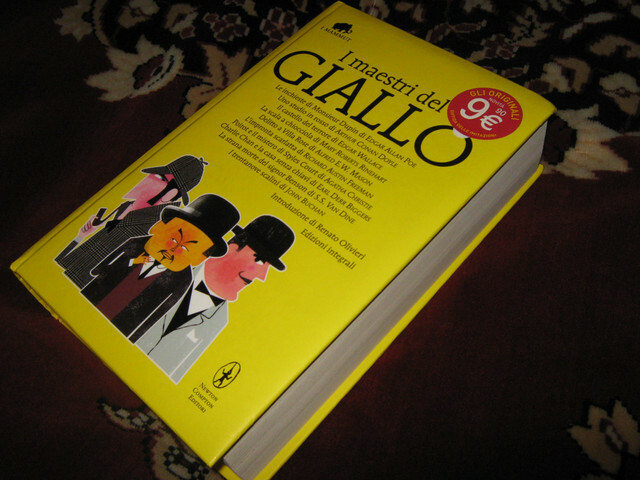 Italian: Finished Edgar Wallace's novel this morning. Booked two more lessons on Skype. All according to plan. Chinese classes on a break - the teacher goes to Moscow for a whole week, and we are left with stuff to learn by heart... good. I was starting to feel frustration setting in, so the break is very welcome. Reading Mary Roberts Rinehart in Italian is very different from reading Edgar Wallace. The style is different, and the translator, too, though I don't think it matters much - they are usually quite faithful to the original text. But the original text is what I don't have, so I amuse myself by reverse-engineering some sentences. And once or twice the book made me laugh very hard. Yeah, that's the language I'm going to start next. 30 minutes on Skype with an Italian tutor. This time I even managed not to shake afterwards, and that's an achievement. She says I'm good.... I wish my second teacher from the local linguistic school could hear that. According to her I was hopeless. LinguaPony wrote: She says I'm good.... I wish my second teacher from the local linguistic school could hear that. According to her I was hopeless. As a language teacher myself, I gotta say that's a horribly unprofessional and untrue thing for her to say. Nobody is hopeless when it comes to language learning. Some people are lazy or don't study for other reasons (although just by looking at your language log I don't think it applies to you) but even they are not hopeless, if one day they start studying they can and will get good at the language eventually. A person who studies is never hopeless.